It’s long been known that when you paste a link into Facebook, it doesn’t always show the preview image you’d like it to show. We wrote a long article about this back in September 2013 titled: How do I force Facebook to use a thumbnail from my website? which explained how you could use either OG data or the Facebook debug tool (lint tool) to get Facebook to update the preview page. Well, fast forward to January 2015 and it looks as though Facebook are trialling the option to upload your own link preview image directly. As of yet this isn’t widespread and we are only seeing it on our Business page and not our Personal profile but it’s a very handy feature to have and we like it very much. When you paste a link into the Facebook post text area, Facebook will scrape your sites data and use what it thinks is the best image but it now gives you the ability to Upload your own image via teh + Upload Image button at the bottom of the picture. By clicking on this you can then upload any image you want from your computer and it will overwrite the default one chosen by Facebook. And remember you can also edit the preview title and summary by clicking on them (hover over the text and it will change to yellow then click). 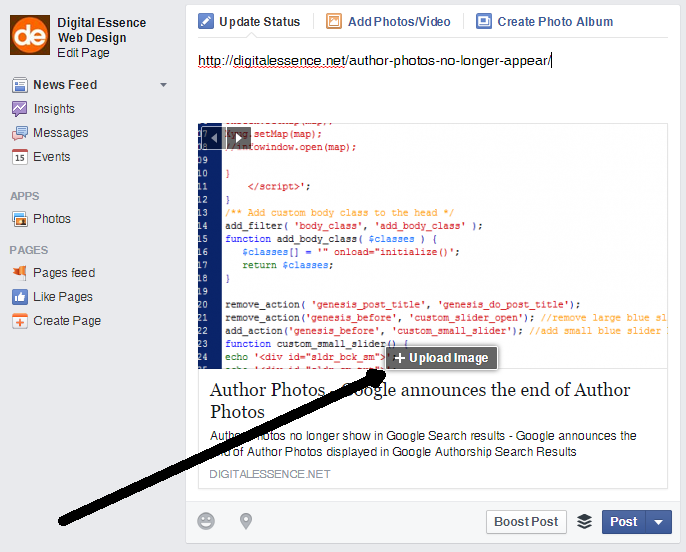 So now you can completely customise the links you share on Facebook!